AdeptiCon 2016 Broken Contract Background and Rulebooks. 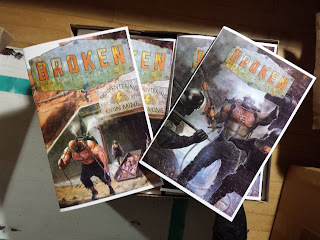 For AdeptiCon 2016 I produced a very short run of Broken Contract Rule and Background books. I don't want anyone who didn't attend feeling left out on the contents so I've collected the files and uploaded them to Dropbox, along with a PDF file handy for printing out your own Character Dashboards and chits so you can get up and playing with the models and cards in your possession. I did deliberately omit the covers of both books for home printing. If you would like to see the covers added, let me know and I will do so. What is in the Broken Contract Background Book? The Broken Contract Background Book is an overview of the FerrumSky setting. In a way, much of it is a collection of essays that were prompted by questions that my editor, Rob Ferrick, has posed to me about the setting. I've written these over time to fill in the blanks and flesh out the microcosm of the FerrumSky mines. These are followed by the character vignettes written during the crafting of the concept art to get into the intent of the base characters. These are written by Rob Ferrick, Chuck Hickey, and myself, At the very end of this collection is a condensed version of 'It's Time', a very well playtested scenario that is ideal for introductory play. This booklet will give you access to information that will likely be parsed over multiple releases as we explore the FerrumSky mines in Episodes. What's in This Incarnation of the Rules? For most of you the Broken Contract Playtest Rules is a brand new ruleset. This book offers very little in the way of background and setting and instead focuses on the ways in which the Characters may interact with their environment and each other. These do not get into creating scenarios or running campaigns. They are the basic rules of play so they will require a bit of creativity or at least the scenario at the end of the Background book in order for you to get playing. For those who have downloaded previous incarnations of the rules there have been a handful of tweaks here, many prompted by playtesting. The newest (and biggest!) addition is the ability to Form Action Teams and perform Team Actions. These rules need thorough playtesting so I would love for you all to try these rules and let me know how they work and what details need to be fleshed out in greater detail. These rules will allow players to expand the model count a bit, but more importantly, they'll allow for those fun thematic moments like trying to carry a large crate or a wounded gen-mod off the board. I am really looking forward to locking them down as an important last touch added to the core rules of play. Finally, I also stripped out most of the background inserted into the rules and put all of the important background into information into the above mentioned book. What are the Character Dashboards and Chits? The final file, Broken Contract Dashboards and Chits, will allow you to print out a Dashboard or placemat that indicates where all of your Character, Equipment, and Ability cards are intended to go. It also has the Chits that you use to keep track of Actions, Wounds, and in game Effects. Please note, when you print this file out I would print out 8-10 of them. The scenario in the Broken Contract Background Book, 'It's Time', uses eight Characters. Print them on cardstock and cut out the chits before playing. What are the Character and Crew Creation Rules? These are exactly what they sound like. This 5 page PDF introduces Character and Crew Creation using a point system. It allows you to create Adult Breakers and Black Squadron Officers, but it also allows you to add Children, Teens, Brute Gen-Mods, or Light Drones to your crew. Each Character is customizable through a series of upgrades using a card driven system. Get Playing and Let Us Know How It Goes! This game was built, in part, on the valuable feedback of our playtesters. We want you to play with your models and we want your input. If you do not own a Broken Contract Initiative Deck already, just use a single suite of cards from a normal deck of playing cards, Ace-8 and a Jack to act as the Re-Roll. This would work just as well for playing the 'It's Time' scenario. Get playing and let us know how it goes! All questions and comments are encouraged. And don't forget that we have the Broken Contract Playtester Group on Facebook.